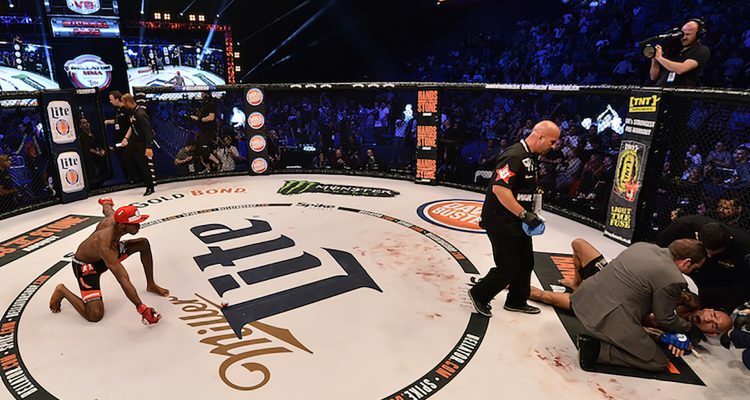 Bellator 158: London - Lima Defeats Daley, Mitrione KOs Thompson, Page Fractures Santos' Skull (photos) » MMA H.E.A.T. Douglas Lima (27-6) and Paul Daley (38-14-2) had been bound to cross paths throughout their Bellator MMA tenures, and on Saturday night at The O2 in London, the welterweight battle finally came to a head. The main event of “Bellator 158: London” pitted the former 170-pound titlist against “Semtex,” an Englishman who has been on a tear since coming back into the fray. Over the course of 15 minutes, the two warriors ripped into each other’s bodies, rocking their foe with shots and scoring takedowns. Much to the chagrin of Daley’s hometown faithful, Lima got the better of Daley, earning a unanimous decision of (30-27 x3). With the win, Lima, eyes a rematch with Andrey Koreshkov, the man who took his title nearly a year ago. Matt Mitrione (11-5) returned to the Bellator MMA cage fresh off his victory at “Bellator: Dynamite 2” and finished Oli Thompson (17-9), winning his second fight in three weeks. “Meathead” and the former Britain’s strongest man winner went toe-to-toe for the better part of two rounds, but at 4:21 in the second frame, Mitrione turned the lights out for Thompson. Now, Mitrione moves ever closer to a shot at the vacant heavyweight belt, something he hopes to claim before the end of 2016. It’s rare when antics following a fight upstage a flying knee knockout, but Michael Page (12-0) managed to do just that with his second round finish of Evangelista “Cyborg” Santos (21-19) on Satuday night in London. The ending came at 4:31 of the second frame, when Cyborg shot for a takedown but was caught in the head with a knee that sent him sprawling to the mat. After that, “Venom” continued to do what he does best – entertain. *Please Note, Evangelista suffered a compound fracture to the front of his skull. A GoFundMe Campaign has been started by Cristiane “Cyborg” Justino to help alleviate medical costs. In light heavyweight action, Francis Carmont (25-11) defeated Lukasz Klinger (7-3) via submission to bounce back from his defeat at the hands of Phil Davis. The end came at 3:54 of the opening frame, when Georges St. Pierre’s training partner used the D’Arce choke to make his opponent tap out. In the opening contest of “Bellator 158: London” James Gallagher (4-0) kept his undefeated record intact, cruising to a unanimous decision victory against Mike Cutting (6-6). “The Strabanimal” did all he could to have an action-packed Bellator MMA debut, but Cutting – who missed weight on Friday – relentlessly circled the cage, avoiding as much toe-to-toe combat as possible. In the end, it didn’t matter, as the 19-year-old cruised to a unanimous 30-27 victory. 1 Comment on "Bellator 158: London – Lima Defeats Daley, Mitrione KOs Thompson, Page Fractures Santos’ Skull (photos)"
Pingback: GoFundMe Campaign To Help Evangelista ‘Cyborg’ Santos With Fractured Skull Hospital Bills | MMA H.E.A.T.